CALIBER'S NEVER-ENDING DESIRE TO IMPROVE UPON THE SAFETY FEATURES OF THE CALIBER LINE HAS RESULTED IN MANY IMPROVEMENTS FOR THE NEW SEries MODELS. Safety is not limited to improvements only, but new features have also been added. For example--the new Fuel Control Panel. Though functionally, it’s still possible to completely switch over from one fuel delivery system to another, it’s now easier with the intelligent auto-routing of the fuel controlled by three-way switching or valves. Additionally, you can now choose which filter system to use with which tank. There are so many unique improvements made to the entire delivery and storage system, it’s called the Caliber Smart Fuel SystemTM. Additional hardware includes a vacuum gauge. An indicator of when a filter element needs replacing. A coarse fuel filter has also been added to trap large contaminants in the fuel before it reaches the primary Racor filters. There’s even more. 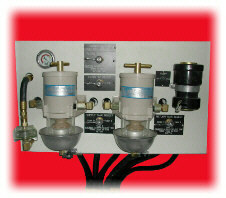 An electric fuel pump is now standard equipment on the SEries panel. This pump is not only installed as a backup pump to the engine’s built-in fuel pump, but is also rated above the normal fuel draw of the engine. So in essence, this pump is a constant fuel polishing (filtering) pump helping to insure the fuel in the tanks is constantly being cleaned while the engine is running. Dual pick-up tubes are installed so the electric pump can be turned on when the engine is not running, doubling its fuel polishing ability. Checking on the status of the fuel and tanks becomes easier with the installation of easy-view inspection plates and reliable gauges with just two moving parts. The emergency electric bilge pump has been upgraded on the SEries models. There is now a dedicated bilge pump capable of pumping 2,000 gallons per hour in an emergency. To be confident it will switch on when required, a special automatic float switch is part of the package. It operates on air pressure and has no moving parts that could cause failure. Another improvement in the SEries is an upgrade to the below the water sea-valves and thru-hulls. As with many other Caliber safety features, there is now backup reliability. The sea-valves are double attached. First, they are attached using the threaded thru-hulls. If the thru-hull should fail, then the valves will still remained attached because they are independently thru-bolted into place. Night sailing on the SEries is made easier and safer with the addition of dual color lights throughout the entire interior. There are clear filter lights for when anchored out or docked in port. 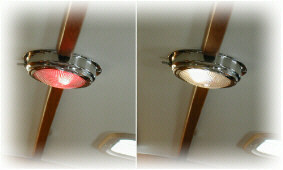 And, there are red filters for saving your sight at night. It’s a small feature, but one that becomes meaningful during those night watches when consistent night vision is critical. Another small, but valuable feature on the SEries, is the installation of a Dripless Shaft Seal. Stopping that annoying dripping of the propeller shaft is now possible. Since it’s water-cooled, it helps prevent the propellor shaft from heating up. It’s standard on the 40LRC SEries and 47LRC SEries models, and optional on the 35LRC SEries model. Topsides, there have been upgrades to the bow and stern pulpits and sail handling gear. Upgrades to sail handling deck gear include more powerful cabin top halyard winches. Traveler control lines are now led directly to the cockpit on all LRC SEries models. Caliber’s custom designed Safety Sea rails are unique in the fact they are substantially longer than any yachts in her class. The stern rail literally envelopes the cockpit creating a secure zone. 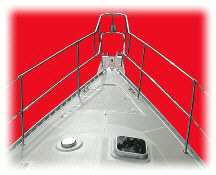 Additionally, the stern rail can be a convenient place to mount solar panels. 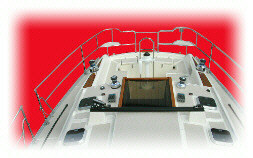 The bow pulpit also has been extended to wrap the foredeck with security. This becomes especially important when going forward for any anchor handling work. All these features and more, add substantially to the safety and ease of use of the new 2005 LRC SEries models. Optional Dripless Shaft Seal available.